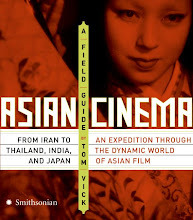 Tom Vick: Asian Cinema Plus: Mark Jenkins on "Roads to the Interior: Another Side of Japanese Cinema"
Mark Jenkins on "Roads to the Interior: Another Side of Japanese Cinema"
Thanks to Mark Jenkins for the thoughtful recap of the Japanese film series I programmed last year at ReelDC. I would like to ask you about a scene from another movie. It's about Gaav, the movie made by Dariush Mehrjui in 1969. I have read about it in your book, then I ordered it on Amazon. I have seen it two days before. It is really a great movie. I posted some thoughts on my own blog (http://updateslive.blogspot.com/), I wrote in Romanian, I am now preparing a post in English. It is much to say about Gaav; I think it could be compared to some extent to the movies of Pasolini; maybe also Parajanov (or Tarkovsky) would come to mind; and it would be interesting to compare the rural universe from Gaav, The Wind Will Carry Us, Shadows of Forgotten Ancestors, Pather Panchali: each one comes to the rural civilization with a different perspective. I searched on imdb and no one seemed to note this scene.